2nd Annual Flower Love Video Contest! 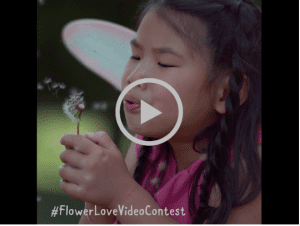 The 2nd Annual #FlowerLoveVideoContest kicked off October 1, 2018. 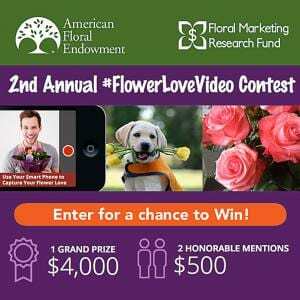 Sponsored by Floral Marketing Research Fund (FMRF) and American Floral Endowment (AFE), the contest aims to inspire creative videos from anyone and everyone who loves flowers, and promotes the use and giving of fresh flowers. Submissions should be 30-60 second videos that may be skits, animation, surprise moments, musicals, testimonials, or other types of videos, as long as they feature and promote fresh flowers. The top 10 video finalists chosen by a selection committee will be eligible for the $4,000 grand prize and two honorable mentions of $500 each. The contest website went live Oct. 1 and the deadline for submissions will be Dec. 2. Finalists will be announced and public voting will begin on Dec. 12. Then the official winners will be announced in late January. At the end of the contest, contest winners and the entire video gallery will be published online as part of a new video library after the contest ends. They will also be used as a part of Flower Marketing Monday. 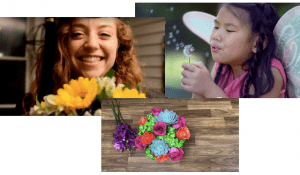 Every Monday, one of the videos is shared on social media and made available for floral industry members to download, personalize and use on their social media or web pages to help promote flowers. Beginning October 1, to submit your video entry you may visit contest.fmrf.org or upload your video with the hashtag #FlowerLoveVideoContest on Twitter and Instagram. No entry will be collected if submitted prior to the launch date. Once the submission period is over, each video will be judged and scored based on certain criteria, including commercial appeal, creativity, and how much the video positively features and promotes fresh flowers. Finally, a public voting process on social media will determine the ultimate winners. Be sure to follow us on Facebook and all other social media to stay up to date on all contest news! Floral Marketing Research Fund’s first #FlowerLoveVideoContest, sponsored byAsocolflores was held last year and promoted flowers and flower-love. View last year’s participants at contest.endowment.org. All videos submitted will become the property of FMRF and AFE. See official rules for entry and complete details. The Floral Marketing Research Fund (FMRF) provides real purchasing data and reports to help you and the floral industry become more profitable. The American Floral Endowment (AFE) is a nonprofit, charitable organization that funds research and scholarships to advance and promote floriculture and environmental horticulture.